Rafael Bugajski used to have a nice page discussing overplays in (simple?) josekis. 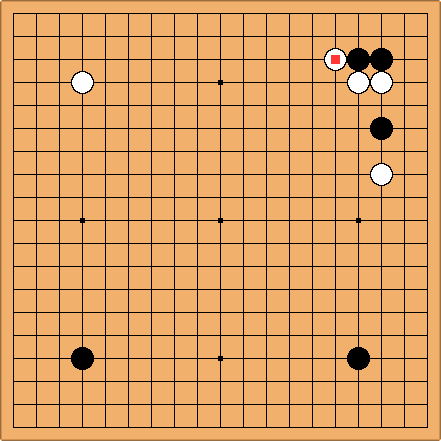 Jan van Rongen: Rui Naiwei has played the "misplaced slide" early in the game (see Rui versus Yun Yeong-seon on 1993-12-21 in the diagram), O Rissei has played it, and a couple of others. This position is also possible from a different move order: white slides first, black pincers and white jumps out, instead of the more usual a. So that might be called a "misplaced jump". In a database of 31,000 games, of 299 games that follow the first move order, 20 games have the "misplaced slide". 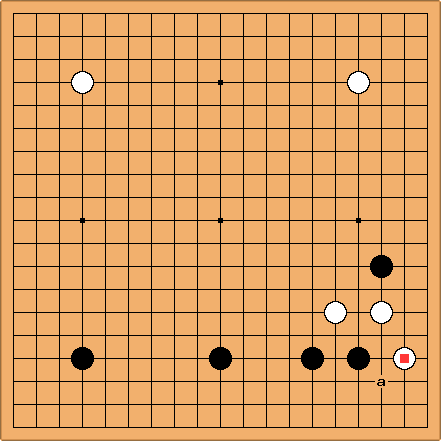 Another 177 games with the second move order, of which 6 have the "misplaced jump". Using Kombilo, on a 10x10 subboard. Also interesting to note is that with the small knight extension by Black (instead of the ikken tobi) the misplaced jump scores 29 out of 189 games and the misplaced slide 21 out of 154, so they are a bit less "misplaced" in that case. -- Jan van Rongen. Charles Matthews Played by Cho Chikun against Otake Hideo in the 1989 Kisei. Tamsin Pardon me, but I think it was Otake Hideo who played this "severe hane" as White here, and he lost the game. Also, Black's first two moves were at 3-4 points. 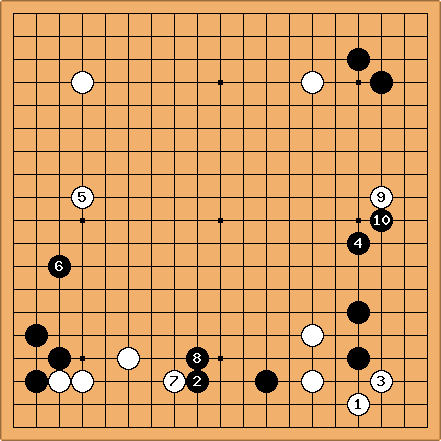 The game was the Kisei Challenger Play-Off (30 November 1989). SAS: SGF file available here. Jan van Rongen Interesting discussion. When are these moves really bloopers? The "severe hane" has been tried two more times by Cho Chikun. So it depends upon the context. The 'conventional wisdom' about why this is considered a bad move can be found at 4-4 point one-space low pincer invasion, interception. Statistical data: In my collection of 20,000+ games, the 'severe hane' is played in 3 out of 933 times the position occurred, all 3 times by Cho Chikun (the extension is played 926 times, the lower hane 4 times).